Hi and welcome back to Attenion-ology for K – 5 Teachers! If your new year began on January 1 you may be ready to make a clean sweep in your classroom as well as at home. Teachers in the earliest English schools literally did that – they brushed the soot off the hearth before lighting a winter fire to warm the class, waving goodbye to the old year and welcoming the new one. The expression, “starting with a clean slate,” comes from that English tradition. You can help your kids make their own clean sweep at the beginning of 2012 by inviting them to join in a BRUSH OUT – BRUSH IN class event. 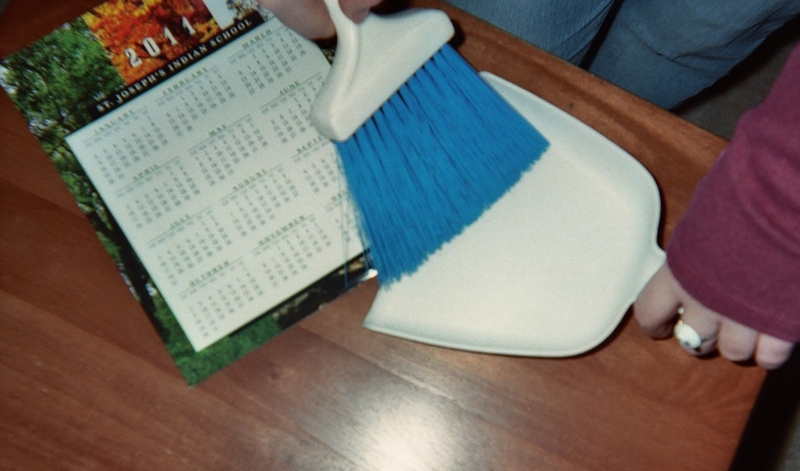 The only tools you need for this attention-getting trick are a small dustpan, a brush, and a now-old 2011 calendar like you see in my blog pic below. Let’s make a clean sweep in the new year! There are lots of ways to host a BRUSH OUT – BRUSH IN event – you may even call it a party – when school is back in session after the holidays. Choose an approach that requires as little or as much time as you want to spend on it. Invite a volunteer to come up and pull out one item from the bag, then another and a third. Ask the three students to stand by to help you make a clean sweep. Give each of them a chance to demonstrate brushing away the 2011 calendar. Expect laughter, but note how well your class pays attention! Explain next, that the real fun (aka work) is ahead. Distribute notebook paper (an activity best suited for grades 3 – 5) and ask your students to write a heading at the top of their papers – BRUSH OUT – BRUSH IN. Instruct them to make a list of what they’d like to sweep away from the old year, then a second list of what they’d like the new year to bring. * Write five reasons why it’s smart to make a clean sweep in the new year. Elaborate around each reason. * Write five ways you plan to pay attention in class in 2012. Elaborate about how paying attention pays off in school. * Write five things from 2011 that you’re happy to wave goodbye to now. Look for pre-cut brooms in teacher supply stores (you may have some left-over from harvest-time classroom decor) and copy small 2011 and 2012 calendars on a printer. If you can’t find pre-cut paper brooms, do a simple drawing – an outline – of a broom shape on a sheet to serve as a master to copy. Print enough copies for the whole class. Pick up on the idea of introducing this activity with the supplies tucked inside a large party bag like I described above. I promise you that a party bag on a table in front of your class is a sure-fire attention-getter! What’s in the bag? It’s a question that will immediately pop into every student’s mind. After you’ve distributed the paper broom sheets and calendars to your Pre-K – 5 kids, invite them to color and cut out the broom shapes. Instruct the kids to hold their paper brooms in one hand and the 2011 calendar in the other, waving goodbye. Ask them to then hide 2011 and hold up 2012, shouting out a big hello! You can follow this clean sweep dramatization with a class conversation about what your kids are looking forward to in the new year. Ask them for ideas that connect with being successful in school. Even young children have good ideas about what it takes to pay attention. Let’s toast to the hope that every student resolves to be a good listener and a good worker in class, under your creative, caring guidance this (new) year. It was so wonderful to see children who normally struggle finally feel success when we had the poetry party and no-bake cupcakes! Their expressions were priceless when they realized they had rhymed!